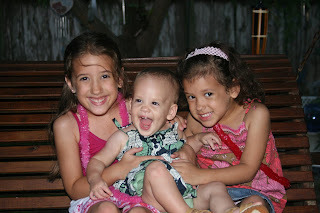 Now that I've caught up with house stuff(laundry and all that), I can finally blog about our Corpus Christi vacation! 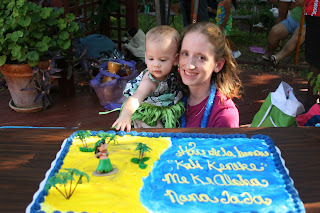 Traditionally in my in-laws culture(they are from the Pacific island of Guam), they throw a luau for babies first birthday. 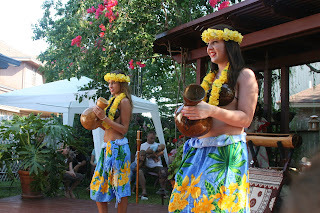 Aubrey and Ella both had luaus too and they rocked! 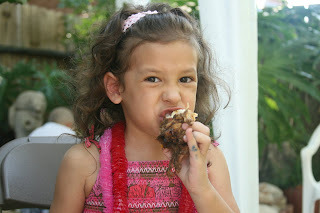 Since we live further away now, the soonest we could have Cali's luau was this month. So, she was lucky and got to celebrate her birthday twice this year! 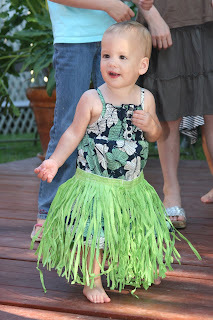 And when I say luau, I don't mean just some Hawaiian themed party. I mean actual hired dancers, Kahlua pork, lots of great island food, shaved ice, the "Biba" money throw for the kids, candy leis, music, the whole shabang! My in-laws(and many others-Angie I know you worked so hard too)worked tirelessly to put this together. Joey and I want to say outloud to the world wide web-THANK YOU! The luau turned out wonderful and we appreciate everything you did. It was so fun! 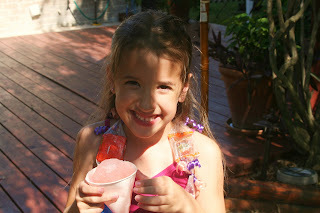 There was even a snocone stand with fresh shaved ice. The kids loved that! 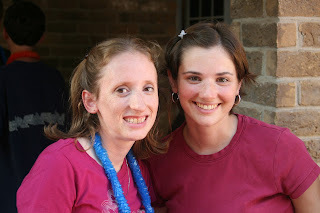 I even got to meet a bloggin buddy, Amber! I was so happy she came. She is in my mom's ward and I had never officially met her. We just sorta hooked up through blogging. She is awesome! And we are even psychically connected(see our matching shirts?!) :) It was great meeting you and your family Amber! 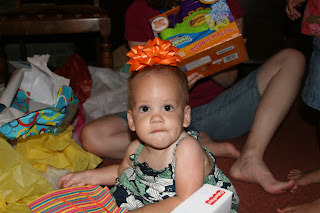 Cali wanting to dig into her cake Present time-this girl made out with presents! 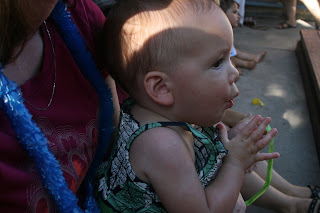 I am posting all of our pictures from the luau in a slideshow(which will be my next post). 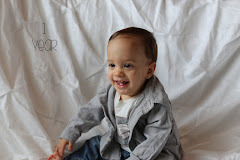 We took a TON of pictures. I just decided to pick a few to post and then stick the rest in the slideshow for anyone interested in seeing them all! What a nice party. I wish that I had some in-laws from Guam. 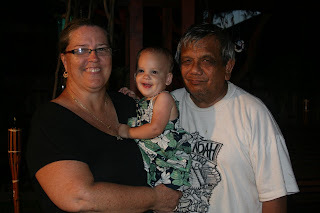 I did have a niece who married a man from Samoa....and like your Nana, his family knew how to party. They threw the best birthday, wedding and funeral (yes I really said funeral) celebrations ever. The parties I gave my kids could not even come close. 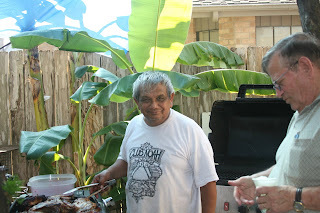 Unfortunately both Sesi and Sue have passed on now but I will never forget the great parties they had. I was happy to get to see your Nana. 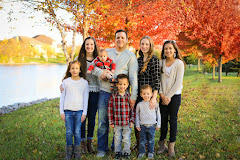 Cyndi has made such nice comments on my blog that I feel like I know her....actually I'm getting to know several of your family...Patty, Tara, Christine, Cyndi and you. What a wonderful family. 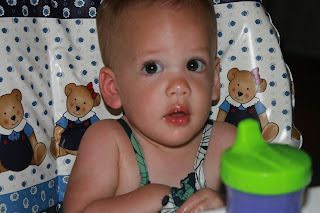 As always thanks for stopping by my blog today. I'm sending (((hugs)) to you. how fun is that?!! it looks like it was an awesome luau. Did you cut your hair? It looks way cute. that is cool you got to meet a blogging buddy. yep, i cut my hair(finally someone mentions it! :) you are a true friend, melissa, very true. thanks for the compliment! Thanks for the pediatric dentist referral. I'll call them Monday. I love the pics of Cali and the girls. 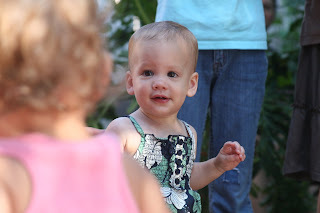 What a fun 1st birthday! You sound like you have great in-laws! I remember going to Ella's luau and thinking it was pretty awesome. I think that is a very fun tradition. I'm so glad you are back to blogging. I missed you. My fam's been in town so I wasn't on the computer much, but I still felt a void. What a wonderful family tradition! I love the pics and all the sweet happy faces on everyone! 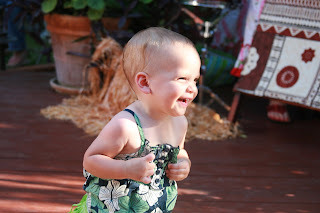 Ah, the one-year luau. I love REAL luaus. So fun! It looks like a blast, great job. WOW!!! that is uh-mazing! what a fantastic tradition. Such a fun family tradition. And that is cool that you got to meet one of your blogging buddies! wish we could have been there. ya'll's luau's are always a blast. happy 1st bday cali! Sorry it's been a while Holly! For some odd reason I didn't type in your address right to my link list and it does not come up, I need to change that. 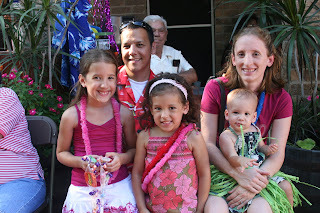 Your Corpus visit looks like a blast, and how lucky to get a luau on every one of your childrens 1st birthdays. That is amazing and very fun. It looks like you guys had a great time. That last picture of the girls is sooo... cute. I'm glad you finally got to meet your bloggin buddy- Amber.